Are you a USC undergrad interested in pursuing your own research on Korean studies, getting academic mentoring, and participating in academic conferences? 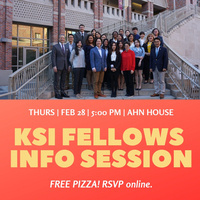 Join us on Thursday, February 28 at 5:00pm at the Ahn House to learn more about the KSI Fellows Program. Free pizza provided! Please RSVP online.